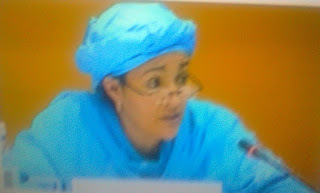 Home / Current Affairs / Latest News / Nigeria / Minister of Environment Amina Mohammed meets with NSC. Minister of Environment Amina Mohammed meets with NSC. Minister of Environment Amina Mohammed meets with NSC and Some quoted coys, on plans to float Nigeria's first ever green bond. Mohammed tells channels Tv new bond targets local and foreign investors.